Pokémon Rumble Blast, known in Europe as Super Pokémon Rumble and known in Japan as Super Pokémon Scramble (スーパーポケモンスクランブル, Supa Pokémon Sukuranburu? ), is an action RPG for the Nintendo 3DS that is in the Pokémon series. The game was released in Japan on August 11, 2011, in North America on October 24, 2011 and in Europe on December 2, 2011. It is a successor to the 2009 WiiWare release Pokémon Rumble. 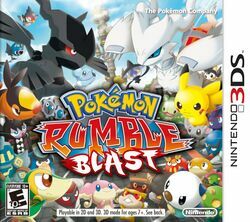 Pokémon Rumble Blast is a Generation V Pokémon spin-off game that plays similar to Pokémon Rumble, a WiiWare released for the Wii previously. The player controls a toy Pokémon that goes through various stages, discovers various towns, and meets friends, allies, and enemies. Unlike Pokémon Rumble, Pokémon Rumble Blast does have a storyline and also has many more new stages and features all Pokémon from Generation I to Generation V with an exception of Meloetta, Genesect, and Keldeo, three unreleased Generation V event legendary Pokémon. This page was last edited on 19 August 2015, at 23:17.